Back in the 90’s, Thérèse drummed with two different African-style Drum groups and still has some awesome drumming buddies who love to come to the Groves and fill the Great Room with rousing enlivening rhythms. Welcome the prodigious drumming talents of Simone LaDrumma, Tom Brighton and Micah Harding! Celebrate the end of 2018 and welcome in 2019 with joy, movement and ENERGY! We’re going to have a blast (again) and we hope you’ll show up and DANCE like crazy! And/or bring your drum and join in. We’ll cook up lively rhythms and activate the dancers in the crowd! The evening will unfold in joyous rhythm and movement as we celebrate the end of the year and call-in the new year! Come prepared to DANCE!! Other drummers are invited to join us some of the time, but this dynamic drumming group (Tom, Simone, Micah, and Therese) will also want to do some racin’ rhythms on their own. No Fee for this event……donations ($5, 10, 20) are always welcome. 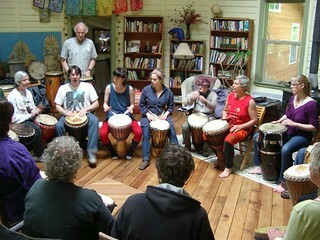 OTHER DRUMS AT SACRED GROVES ….. 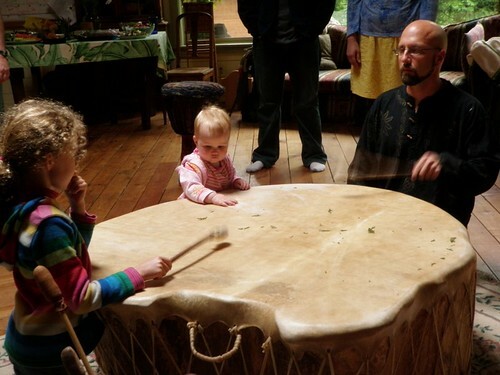 The other kind of drumming that happens here comes to us from the native peoples of this North American continent. This kind of drumming has a group of us standing around a “Mother Drum” (sometimes called a “pow wow drum”) drumming, singing, praying, playing. The Mother Drum that lives at Sacred Groves is “Tree Heart,” is a beautifully crafted massive drum made of cottonwood and elk hide. Her voice always starts our drumming evenings and finishes the night in a prayerful way.